I love everything about garlic. My apologies to all my dear garlic-phobic friends but, seriously? I mean, take a look at this picture. 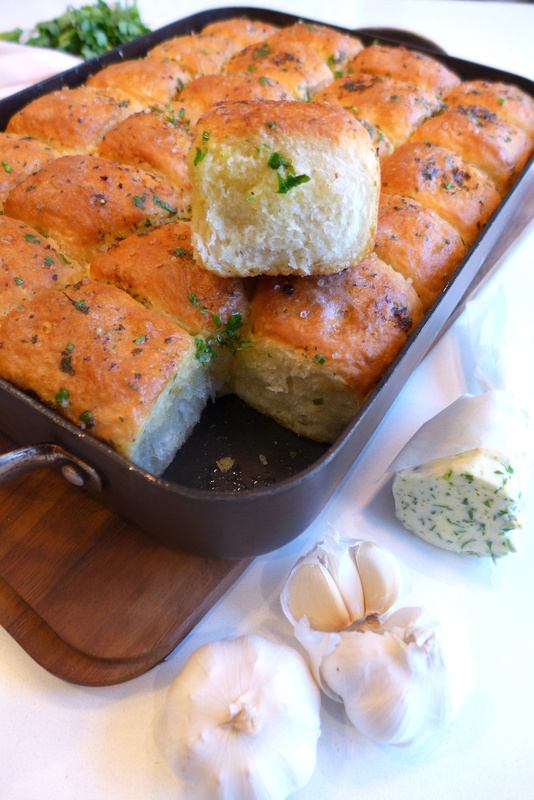 If you have never tasted garlic bread, you are missing one of life’s greatest culinary pleasures. It’s very easy to prepare and don’t get me started on the fantastic smell in the kitchen as it bakes.You can shape it as a long loaf or as a pull-apart bread, which I find very convenient when you are entertaining. Make garlic butter, while dough rests. Put soft butter in a bowl. Add the garlic, parsley, zest and chilli powder. Mix well with a spoon until all ingredients are incorporated. Divide butter in three equal parts. Use 1/3 to butter the base and sides of a rectangular (25 x 35 cm approximately) baking tray. When the dough has risen, put on a floured surface and punch down to deflate. Divide in two and roll two ropes. Cut each rope into 12 pieces. You will have 24 pieces in total. Shape pieces into balls and put one next to the other in the pan, making 4 rows with 6 balls on each row. Brush with the other 1/3 of the garlic butter. (At this stage you can keep the garlic bread in the fridge, covered with plastic wrap. Just make sure it’s in room temperature before you bake it and has risen slightly). Cover the bread with a clean kitchen towel and let it rise for 1 hour. Preheat oven to 190 C, while bread rises. Sprinkle bread with some coarse sea salt and bake in the preheated oven for 30-35 minutes until golden in colour and cooked through. Take baking pan out of the oven and while bread is hot, brush with the remaining 1/3 of the butter. Serve at once. Note: You can divide the dough into more pieces and shape smaller balls, 30 or 35 even. In this case you need to reduce the baking time by about 5 minutes.